According to recent ESG research, 70% of IT respondents indicated they plan to invest in HCI over the next 24 months. 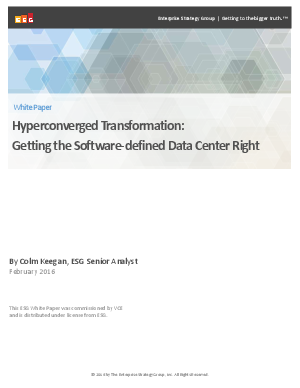 IT planners are increasingly turning toward HyperConverged Infrastructure (HCI) solutions to simplify and speed up infrastructure deployments, ease day-to-day operational management, reduce costs, and increase IT speed and agility. HCI consists of a nodal-based architecture whereby all the required virtualized compute, storage, and networking assets are self-contained inside individual nodes. These nodes are, in effect, discrete virtualized computing resources “in a box.” However, they are typically grouped together to provide resiliency, high performance, and flexible resource pooling. And since HCI appliances can scale out to large configurations over time, these systems can provide businesses with investment protection and a simpler, more agile, and cost-effective way to deploy virtualized computing infrastructure. Read this paper to learn more. Intel Inside®. Powerful Data Center Outside.